Having never read Volume 1 of Demon, I was expecting to have a bit of an issue sinking into Volume 2. Instead, I immediately responded to the strange, dark, action-packed book. The summary for Volume 1 is told through a set of 20 square frames. We see that Jimmy Yee wants to die because his wife and daughter were killed in a car accident. He devises a plan to avenge their death which entails robbing a bank. He is arrested and killed. After he’s killed he possesses whatever body is nearest to him. He is a demon. 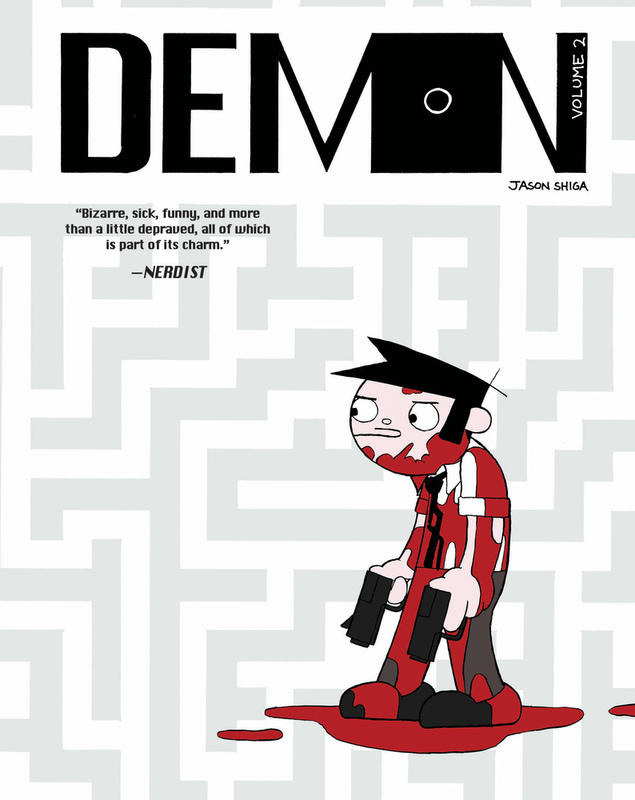 Volume 2 continues the story with Jimmy trying to understand the nuances and limits of his demon abilities. He does this by killing a variety of people and possessing their bodies. How long do the possessions take, are they instantaneous? If he possesses someone with advanced or deficient mental abilities will that transfer to him? Which components of a person are mental and which are physical? When Jimmy kills/possesses someone, people still see the original person, head and all. But he (and we as the reader) she the new person’s body with Jimmy’s head on it. When Jimmy looks in a mirror he sees his own face, but when he touches his face he feels the features of the person he has possessed. It is this attention to detail and high level of creative thinking that pulled me into the story. It’s fascinating to look at and think about. Jimmy goes on to learn that his daughter is still alive, that she is a demon too, and that demonism is a genetic trait. There are some epic fight scenes, a conspiracy theory, an action packed plane segment and a good-ole cliff hanger ending that leaves readers anxious to crack open Volume 3, which will be released in July of this year. Shiga’s illustrations are enviably simplistic. He has a masterful understanding of scale and depth perception and plays with what is included in each frame. For example, in the pages above there are no two frames with the same background, each frame propels the story forward. Jimmy is a fully unlikeable, deplorable human, yet if you allow yourself to question the idea of demons, to focus on his unyielding love for his daughter and listen to the ideas of this innovative storyteller, there is a rich payoff. Previous Read Award Nominated Scripts FOR FREE at Indiewire – La La Land, Moonlight & More!